Why should I clean my pet’s teeth? Cleaning your pet’s teeth is not only a cosmetic concern, tooth plaque contains bacteria that can infect gum tissue and the roots of teeth, which can result in oral disease and tooth loss. Additional negative impacts on oral health, bacteria can enter the blood stream through large blood vessels located near the gums and teeth, this bacteria travels to the organs with the highest blood flow; the lungs, heart, kidneys, brain and the liver, causing infections that can shorten your pet’s life. 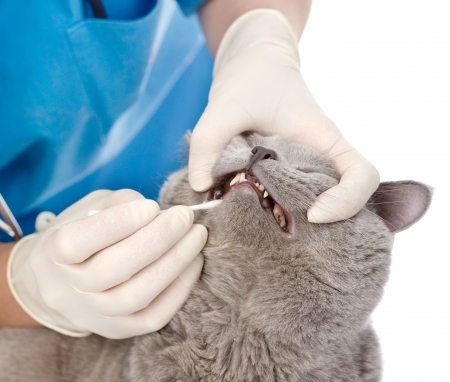 Regular non anesthetic pet dental cleanings can help prevent and minimize this from happening your pet. Please arrive 10 minutes prior to your appointment time to fill out any information like our consent form on site. To speed up this process we encourage you to complete the form below and submit it to us prior to your appointment date that way it’s an easy and quick drop off time for you. Non Anesthetic Pet Dental Cleanings take about 45 minutes to 1 hour, you are welcome to stay and wait for your pet and talk to our technician after the procedure. This time is an estimate and it could take longer depending on the behavior of your pet and the amount of plaque in the mouth so please allow 2-3 hours in your schedule when you make your pet’s non-anesthetic dental appointment. The technician is happy to explain the Dental chart form, so allow some pick up time to listen and understand our further recommendations to maintain the teeth clean after the non-anesthetic dental procedure. Your pet can go home right after the procedure and continue life as always. So do offer water when you arrive home and food after 1 hour. Playtime, outside walking, and other activities can be continued normally after the procedure. We encourage you to continue with at home dental care to ensure the dental cleaning lasting results. Don’t forget to make your pet’s 6 months non-anesthetic pet dental cleaning appointment and contact us with any questions or concerns. 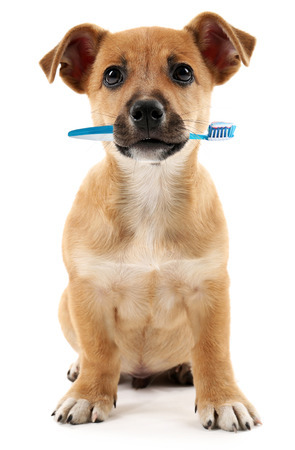 We are here to help you achieve your pet’s best oral health. How to brush your pet’s teeth. The first step is to start with a clean, healthy mouth. Good dental hygiene should start with a young pet with healthy new teeth and gums, or after your pet has had a dental cleaning. You will need a soft-bristled tooth brush and pet formulated toothpaste only. DO NOT — USE Human toothpaste as they are harmful dog pets. Furthermore, pet formulated toothpastes have flavors that are appealing to them. Start by offering your dog a taste of the pet toothpaste. The next time, let him taste the toothpaste, then run your finger along the gums of the upper teeth. Repeat the process with the tooth brush. Get the bristles of the brush along the gum line of the upper back teeth and angle slightly up, so the bristles get under the gum line. Work from back to front, making small circles along the gum lines. It should take you less than 30 seconds to brush your pet’s teeth. Do not try to brush the entire mouth at first. If all that your pet lets you brush is the outside of the upper teeth, you are still addressing the most important area of periodontal disease – prevention. If your pet eventually allows you to brush most of his teeth, so much the better. Even with the best tooth brushing, some dogs may still need an occasional dental cleaning, just like humans. By brushing your pet’s teeth daily we prevent issues before they even start and you may reduce the frequency and involvement of dental cleanings and provide your pet with a happy, Healthy Smile. If you have any questions about how to brush your pet’s teeth and products to use don’t hesitate to contact our team. We are happy to give you tips and products recommendations. If you would like to schedule an appointment for your dog or cat to get a non anesthetic pet dental cleaning from one of our highly trained technicians please fill out the form below.